There may be more hope than has been recognized for some people with severe brain injuries, according to a U.S. neurosurgeon who earlier this year spent four months in Iraq treating soldiers and civilians. Jason Huang, M.D., this week presented his results from his experience in Iraq at the annual meeting of the Congress of Neurological Surgeons in Orlando, Fla. Huang discussed blast injuries, a type of wound that has affected thousands of U.S. soldiers and others in Iraq. The term includes injuries caused by roadside bombs or improvised explosive devices ("IEDs"), as well as car bombs, suicide bombs, and other blasts. "This is a type of injury unlike anything seen regularly here in the United States," said Huang, an assistant professor of Neurosurgery at the University of Rochester Medical Center who is also a major in the U.S. Army Reserve. "Here we might see gunshot wounds to the head, or severe injuries from motor vehicle accidents, but we don't see blast injuries, and so neurosurgeons haven't really had much experience treating them. What we're seeing in Iraq is different even from injuries suffered by soldiers in previous wars. The extent of the blast injuries was far worse than I ever would have imagined," Huang said. When Huang arrived in Iraq in January, he received a crucial piece of advice from the departing neurosurgeon. The doctor told Huang that the results of a CT scan – a standard initial step with most patients with head injuries – should be viewed cautiously when they pertain to people who had been injured by a powerful blast. Huang quickly learned that soldiers with blast injuries oftentimes were worse off than their CT scans indicated, with, for example, more swelling of the brain than a CT scan might indicate. As a result, Huang took more aggressive surgical measures than he might otherwise have undertaken. One common tool for neurosurgeons is a procedure known as a craniectomy, where a piece of the skull is removed temporarily to allow the injured brain to swell without being damaged. For many injured soldiers, Huang performed larger-than-usual craniectomies. While textbooks and years of training dictated a smaller procedure, his experience and that of his colleagues in Iraq suggested that the more aggressive approach would be useful. In his presentation at CNS, Huang discussed the cases of several soldiers and some civilians who came to Balad Medical Center, about 60 miles north of Baghdad, where all U.S. soldiers in Iraq with severe brain injuries are treated. Such patients are often evaluated with a standard tool known as the Glasgow Coma Scale, which describes their level of neurological activity. The scale goes from 3 to 15, with a lower score indicating severe injury; the tool measures such things as whether the person is conscious, can speak, and responds to pain. Huang and colleague Richard Clatterbuck, M.D., Ph.D., of Johns Hopkins University found that while the predicted outcome for patients who score from a 3 to 5 is dire, some of these patients in Iraq survived their brain injuries and did comparatively well. "Most of the soldiers still face a long rehabilitation process, including intensive physical therapy, occupational therapy and speech therapy, at Walter Reed Medical Center," said Huang. "But the fact that they survived the most devastating head injury, considered unsalvageable by most civilian physicians, is in itself a miracle." One key was aggressive therapy, such as large craniectomies performed immediately. "Sometimes, aggressive therapies can be critical for patients who, previously, might have been assumed to have very poor outcomes," said Huang. "The lesson is that the GCS score is not entirely predictive of outcome. There is hope for these patients. "In Iraq, we have a young, very healthy population of U.S. soldiers who have an exceptionally strong will to survive, along with a well-structured support network for rehabilitation back in the United States. In addition, in Iraq, no soldier is more than two hours away from treatment by a neurosurgeon, and speed is essential." 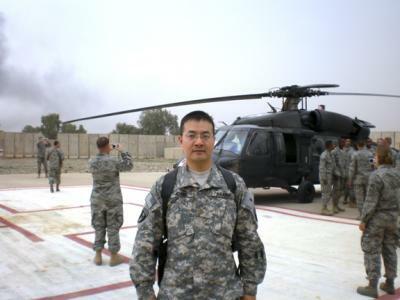 Huang also treated Iraqi civilians who had been injured, and he was able to monitor their progress more closely than seriously injured U.S. soldiers, who were quickly evacuated from Iraq after being treated. He knows of two children with severe head injuries, one who had the lowest-possible GCS score of three and the other who scored five, who survived and returned to their usual lives. Huang is continuing his studies of brain injuries in his laboratory at the University of Rochester Medical Center, where he is also a researcher in the Center for Neural Disease and Development. Perhaps some lessons learned from soldiers in Iraq can be applied to a broader set of patients at home, he said.